Do you want to breeze through lot of emails in Gmail without taking the trouble of opening each email message one by one? “Message Sneak Peek” Gmail labs feature allows you to quickly preview any email messages in the main inbox window without the actual need to open the email message. 1. Login into Gmail account and click ‘Settings’ at top right. 2. Then click on ‘Labs’ tab and search for “Message Sneak Peek” listing. 3. Click enable next to “Message Sneak Peek” and then click ‘Save changes’ button at the bottom. 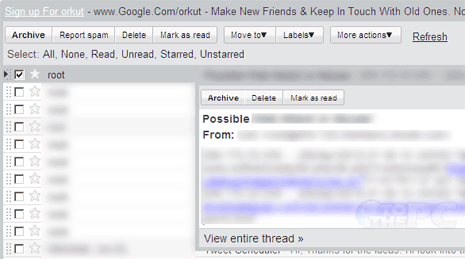 Besides the individual message preview option, there is also full inbox preview feature in Gmail. It can be very useful while accessing Gmail on slow internet connection. Google Chrome OS, operating system by Google !